Under "hobbies" in her profile Annette listed, "Fishing, making my own chocolate, and making my own cutlery." It was a curious mix of pastimes and I pointed that out to her in one of our email chats. She wrote, "I've been making knives since I was five. I really need to get a website together." When I asked her, "Why knives?" she replied, "They're fun and easy to make. Plus no one messes with ya." "Knives," she opened her pack and showed me a bunch. "Check them out." Indeed she had a lot of homemade knives. She said, "I'm taking them around to some gun shops and jewelry stores later today. Figure some might want to buy them." She had a lot of them but they were all very cheaply made. It was as if she had taken a block of wood, shaped it into a sort-of cylinder, wired an old blade to the block with paper clips, and presto! Knife! She reached into her death bag, pulled out a particularly tetanus-inducing-looking blade, and swung it around herself indiscriminately in the family-friendly place. "This is for you. Take it." She handed it to me blade first, which even in kindergarten I learned was a no-no. I took it as carefully as I could and thanked her. I didn't have anything to put it in. It wouldn't fit in my pocket and I sure wasn't going to brandish it around with me in public. I went to the bathroom, grabbed a wad of paper towels, and wrapped it in them. She was otherwise pretty single-minded about the fishing and the chocolate making (admittedly the most interesting part of her) and the blade forging. We parted as friends and I still have a fine blade by which to remember her. Of course, she later added me to her "blade-of-the-month" mailing list in which she - no joke - emails me and perhaps a few other people the same photo of the same homemade knife every month. Since she was 5 she has been gearing up for her future time in prison. *said in a Philly accent* "Hey, you want a good shank, you go see Annette, you know what I'm saying." Whoa whoa whoa, why you making fun of Philly? No way! Just want the right attitude behind the statement. 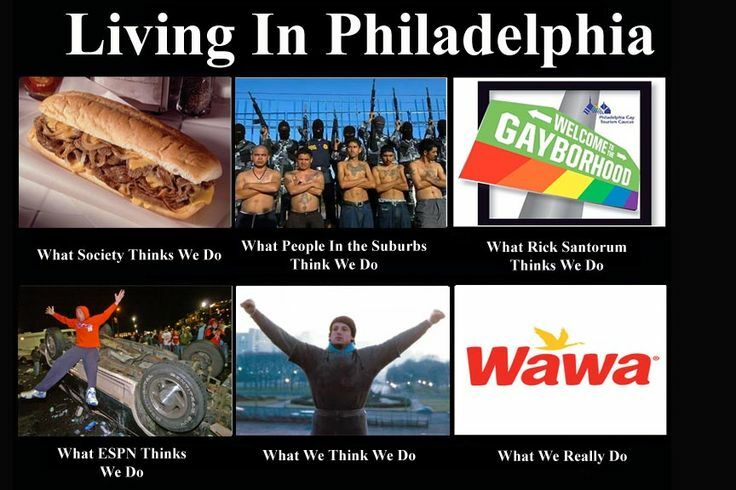 Everyone knows what Philly is all about. Damn it, A, you beat me to my comment again! I have to start getting up earlier. That's a pretty accurate chart. One benefit of being from Philly is that Bananas gets all juicy-goosey for my accent, which is nice... She's all like "Squeal! Say "wooder" again!" Archie Girl, do you have a sister? I require a Steve Girl. Steve, I have two! But neither of their names are Steve or even Stevie, so I don't know if either of them would make a good Steve Girl. Womp womp. You'll have to stick with Bananas, good thing she puts up with you. I bet she listens to Knife Party and watches Oz.